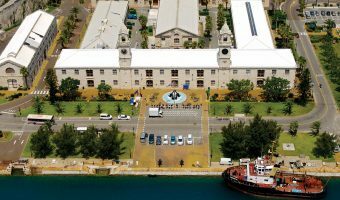 The Orange Route from Royal Naval Dockyard (Kings Wharf/Heritage Wharf) to St George is a seasonal route aimed at tourists, in particular cruise ship passengers. The ferry runs from April to end of October. The journey time is around 45 minutes. The Dockyard Ferry Stop is easy to find. All cruise ships dock at Kings Wharf or Heritage Wharf. Cruise passengers will have no choice but to pass it when disembarking from their ship. The St George’s Ferry Stop is located at Market Wharf, just east of King’s Square. Scooters are not permitted on this service. The adult return fare from Dockyard to St George is $10 if you pay by cash. Savings can be made by buying tokens or a bus and ferry pass. Booklets of 15 tickets are also offered. They cost $37.50. At Dockyard you can buy tokens, passes, and ticket books from one of the three Visitor Information Centres. The main one is situated next to the Ferry Terminal. The other two are at the cruise ship wharves. In St George you can buy tokens, passes and ticket books from the Visitor Information Centre on Kings Square or from the St George’s Post Office. The Orange Route is a seasonal service running in the summer months only. The service will resume in April 2019. 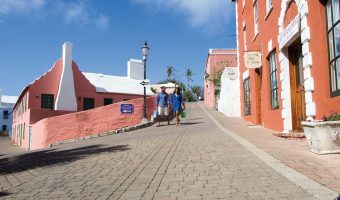 Although Dockyard is a historic site with plenty of attractions and things to do, St George is a lot older. In fact it’s a UNESCO World Heritage Site. St George was the island’s first settlement and was originally the capital. Its architecture is much more rustic and quaint than the imposing fortified buildings at Dockyard. Many of the town’s buildings date back to the 17th century. From St George’s Ferry Stop it’s just a short walk to Kings Square, the main square in the town. Most of the attractions in the town are within walking distance of the here. On King’s Square itself you’ll notice replicas of the stocks, pillory, and whipping posts used to punish criminals in times gone by. Today they provide a unique photo opportunity for tourists. The White Horse pub is also here and is a great place to sit and have a drink while watching the boats in St George’s Harbour. Ordnance Island is just south of King’s Square. Here you’ll find a replica of the Deliverance and a small park with a statue of Admiral Sir George Somers. Water Street runs east from King’s Square. The street is home to the Tucker House Museum and Somers Wharf, a mixed-use development with stores like Vera P Card and the Island Shop. St Peter’s Church is the town’s biggest attraction. It’s the oldest Protestant church in the Western Hemisphere and is packed with interesting artefacts. The Unfinished Church was meant to replace it, but was never completed. There are some good beaches within easy reach of St George. Tobacco Bay is around ½ mile from the town centre and Achilles Bay just a little further. If you don’t fancy the walk you can take the private mini-bus service from King’s Square. The map below shows the route taken by ferries on the Orange Route. Click here for an interactive map showing points of interest and more.